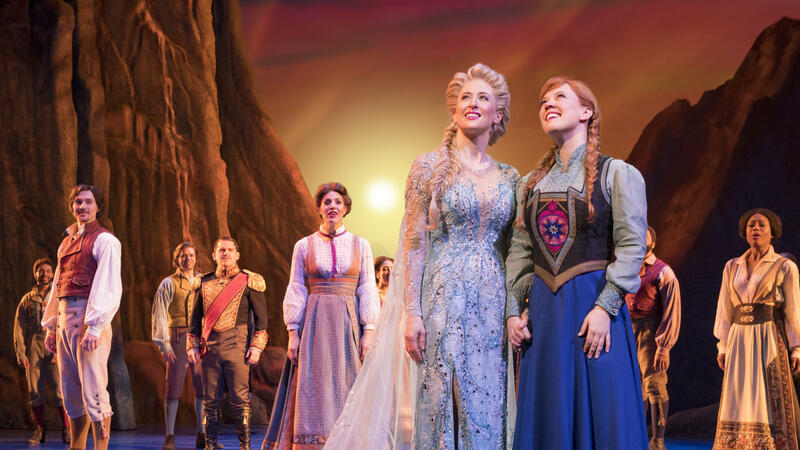 Caissie Levy plays Elsa (left) and Patti Murin plays her sister Anna in the Broadway musical version of Frozen. Since the Disney animated musical Frozen premiered five years ago, the song "Let It Go" has been inescapable. Even the daughters of its songwriters were a bit tired of it. "Like many people in our culture, there was a feeling of Frozen fatigue, if you will," says co-songwriter Kristen Anderson-Lopez. Yet Anderson-Lopez — and her husband, Bobby Lopez — jumped at the chance to adapt it for the stage, because there seems to be an insatiable hunger for the story. Frozen is, after all, the highest-grossing animated film of all time. 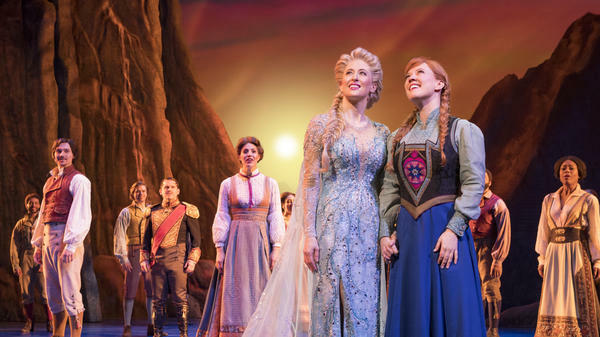 Now, the fairy-tale celebration of sisterhood has been turned into a $30 million Broadway musical — and it's virtually sold-out until the end of the year. Director Michael Grandage says that's a bit of pressure. "I went into it knowing that I have a huge responsibility not to let the people who know it very well down," he says. "And I think all that means is that you take that source material and you honor it." That might sound easier said than done. "When you choose a story for animation, you choose things that could not exist in the physical world," says co-songwriter Bobby Lopez. "You have to have a story that involves that stuff, because animation can do that so well. And then onstage, you're limited by gravity and things like that." That was a challenge for Jennifer Lee, who co-directed the film and wrote the script to the theatrical version. "We don't have the same special effects where it defies physics, but we have real human beings on the stage, which does a lot more," Lee says. "It affects us, I think, in a much deeper way. And I think theater — there's always a suspension of disbelief where you surrender to it." The Broadway production does have Olaf the snowman and Sven the reindeer, recreated as human-sized puppets. And the big blizzard at the end is recreated by a swirling orchestra and chorus. The two-act stage adaptation also gives the creative team more time to play with. They've added a dozen new songs, like "What Do You Know About Love?" for Princess Anna and Kristoff — the mountain man who she falls for as she goes on her quest to save her sister. The writers wanted to create something that was not just a rehash of the movie or just for the little girls who show up at the theater dressed as the two sisters. "We were not making your toddler's Frozen," says Kristen Andersen-Lopez. "We were making a sophisticated dignified adult psychological Frozen." Bookwriter Jennifer Lee says they particularly wanted to give new songs to Elsa — the cursed Snow Queen — who's something of a secondary character in the movie. "She has a song called 'Monster' that is really deep and really explores the fears of: Is she a monster?" Lee says. "Should she even exist anymore? You can't — you're not going to do that in a Disney animated film." Existential problems aside, there's plenty onstage for the little girls (and boys) in the audience. And, if you're not suffering from Frozen fatigue, the writers are hard at work on a film sequel. Disney's "Frozen" is the highest-grossing animated film of all time. And now this fairy tale celebration of sisterhoods has been turned into a $30 million Broadway musical. B.J. Leiderman, who writes our theme music, is not the composer. But expectations and the stakes are high anyway, as Jeff Lunden reports. JEFF LUNDEN, BYLINE: Since the movie premiered five years ago, this song has been inescapable. LUNDEN: Even the daughters of co-songwriter Kristen Anderson-Lopez were a bit tired of it. KRISTEN ANDERSON-LOPEZ: Like many people in our culture, there was a feeling of "Frozen" fatigue, if you will. LUNDEN: But she and her husband, Bobby Lopez, jumped at the chance to adapt it for the stage because there seems to be an insatiable hunger for the story. In fact, the Broadway production is virtually sold out until the end of the year. Director Michael Grandage says that's a bit of pressure. MICHAEL GRANDAGE: I went into it knowing that I have a huge responsibility not to let the people who know it very well down. And I think all that means is that you take that source material, and you honor it. LUNDEN: That might sound easier said than done, says co-songwriter Bobby Lopez. BOBBY LOPEZ: When you choose a story for animation, you choose things that could not exist in the physical world. You have to have a story that involves that stuff because animation can do that so well. And then onstage, you're limited by gravity and things like that. LUNDEN: That was a challenge for Jennifer Lee, who co-directed the film and wrote the script. JENNIFER LEE: We don't have the same special effects where it defies physics. But we have real human beings on the stage, which does a lot more. It affects us, I think, in a much deeper way. And I think theater - there's always a suspension of disbelief where you surrender to it. LUNDEN: So the Broadway production does have Olaf the snowman and Sven the reindeer recreated as human-sized puppets. And the big blizzard at the end is recreated by a swirling orchestra and chorus. The two-act stage adaptation gives the creative team more time to play with. They've added a dozen new songs, like this one for Princess Anna and Kristoff, the mountain man she falls for as she goes on her quest to save her sister. JELANI ALLADIN: (As Kristoff, singing) Love's not a thing you get. It's work and tears and sweat. PATTI MURIN: (As Anna, singing) So says a sweaty, smelly mountain man. JELANI ALLADIN AND PATTI MURIN: (As Kristoff and Anna, singing) Oh, what do you know about love? What do you know about love? LUNDEN: The writers wanted to create something that was not just a rehash of the movie or just for the little girls who show up at the theater dressed as the two sisters, says Kristen Anderson-Lopez. ANDERSON-LOPEZ: We were not making your toddler's "Frozen." We were making a sophisticated, dignified, adult, psychological "Frozen." LUNDEN: Book writer Jennifer Lee says, in particular, they wanted to give new songs to Elsa, the cursed snow queen who's something of a secondary character in the movie. LEE: She has a song called "Monster" that is really deep and really explores the fears of, is she a monster? Should she even exist anymore? And you're not going to do that in a Disney animated film. CAISSIE LEVY: (As Elsa, singing) Do I kill the monster? Father, you know what's best for me. If I die, will they be free? Mother, what if after I'm gone, the cold gets colder, and the storm rages on? LUNDEN: Existential problems aside, there's plenty onstage for the little girls and boys in the audience. And if you're not suffering from "Frozen" fatigue, the writers are hard at work on a film sequel. MENZEL: (As Elsa) (Singing) Let it go. Let it go. And I'll rise like the break of dawn... Transcript provided by NPR, Copyright NPR.